ALLRUSSIAS - "500 Days Program"
In the summer of 1990 the Supreme Soviet and the government of Russia controlled by Yeltsin’s supporters prepared a plan for a radical move toward a free-market economy under the name of the “500 Days Program.” It involved the freeing of prices and the private ownership of enterprises, land, services, and so on and had more in common with the “big bang” approach being adopted in Poland than with Gorbachev’s intentions of a gradual, step-by-step introduction of a regulated market economy. 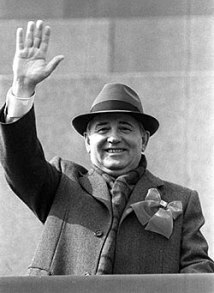 To the Russian radicals’ surprise, Gorbachev agreed to cooperate and submitted the Russian program for the approval of the USSR Supreme Soviet and of the all-union government. The all-union bodies, however, stripped the program of all its radicalism and rewrote it in a form unacceptable to the Russian government. 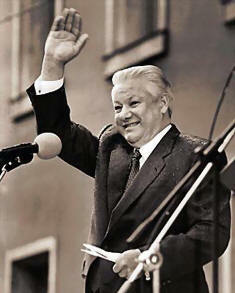 Yeltsin and his supporters saw the debacle of the “500 Days Program” as a wicked ploy by Gorbachev to derail their reform plans, and they now took the view that any further cooperation with the existing all-union authorities was pointless. They now intensified their struggle for Russia’s independence from the union authorities and Gorbachev in order to be able to carry out a radical economic restructuring within Russia separately from the rest of the union. Gorbachev was now left without the support of the leadership of the biggest of the union republics and also without a viable economic policy. Moreover, his wrangling with the radical democrats on the Left did not win him friends on the Right: Gorbachev increasingly came under attack by the conservatives, who now felt that if they applied enough pressure he would always abandon radical reform.